NailSnaps encourages limitless creativity and self expression with the world’s best way to create, share, and wear custom nail art. Nail art has exploded into mainstream demand due to social sharing – it’s one of the top 5 most shared items on Instagram and Pinterest with 8.5 billion dollars a year spent on nails. Yet keeping up with this trend can challenging. A basic salon manicure averages $20, but custom art on each finger can cost more than $50. DIY techniques are cheaper but they’re messy and require lots of skill, materials, and steady hands. Off-the-shelf nail wraps offer convenience but they eliminate the opportunity for creative self expression. So for most women, personalized nail art is an aspiration rather than reality – until now. 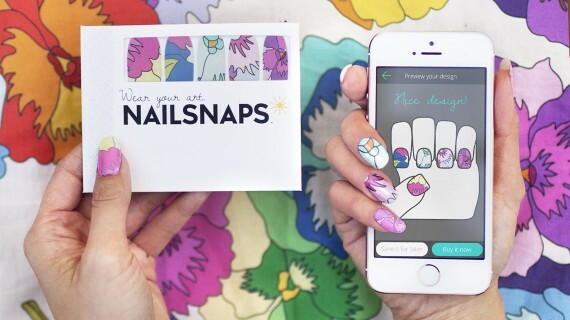 The free NailSnaps mobile app empowers women to easily create stunning nail designs from any photo using a patent-pending, rotatable, resizable hand-pose stencil. We print and ship custom design as 20 nail wraps: 2 full sets of 10 directly to the customer for just $19. The wraps can be applied at home in minutes with a just a simple nail file. Application is as easy as placing a sticker and filing off the excess. A perfect, totally custom manicure. All the creativity, none of the hassle. NailSnaps delivers an exceptional user experience across physical and digital touch-points. From the free mobile app to the physical wraps and packaging, we tested and iterated with real users to create an optimal creative experience making custom nail art easy and fun for everyone. NailSnaps deserves to win in the Expressing category because it offers limitless creative expression by revolutionizing the way nail designs are created and applied. The NailSnaps mobile app lets people create nail designs featuring anything they see – favorite skylines, holiday vistas, loved ones – the possibilities are endless. People are no longer limited by the number of colors they own or their ability to paint with tiny brushes. The hand-pose stencil offers endless creative flexibility. Repeat part of an image on all nails, or use different parts of an image to create one complete picture – like a skyline that spans from pointer to pinky. Since the launch of our live public beta in Dec 2014, the NailSnaps community has created an inventory of over 30k totally custom nail designs! Each unique design tells a personalized story in 5 fingers. We were listed on the App Store’s Best New Apps list and we’re in the process of securing a global patent as the world’s best mobile/social nail design platform. It’s fast, easy, and addictive and our numbers prove it: 20% of users come daily, 50% of users return every month, and our average user session length is over 5 minutes! Nailsnaps revolutionizes nail design and makes the whole world your manicure.